Problem: Things that are heavier do not go faster than things that are lighter, discounting negligible differences in air resistance. In a vacuum, even a feather and a bowling ball would fall at the same speed. An object can only go slower than the rate of free fall acceleration, as it meets resistance. If you don't believe it, watch this Galileo demonstration, where the dropped tire and car reach the ground at the same time. The car doesn't get their first, though you might think it would because it is much heavier. The towers "fell" at the same rate as they would have fallen through thin air. But steel, even soft steel, is thousands of times denser than air. Think of it another way. Look at the picture below. 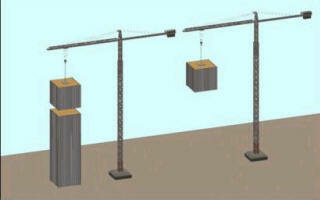 Which block reaches the ground first? Because on 9/11, they both reached the ground at virtually the same time. But given the difference in the mediums they are falling through, air versus construction grade steel, the one on the right would reach the ground first, because there is nothing between it and the ground. 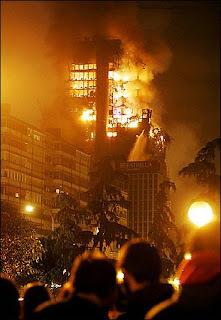 On the left you have the bottom three-quarters of each tower, which disappeared as if it were nothing. What would have happened was the top of the tower might start to fall, then creak to a halt, because momentum is absorbed by the mass below. There are many instances of partial collapses, a few floors here, one side of the building there. But they don't disappear into thin air in 14 seconds. Perfectly. Three times in a row. Below: Windsor Hotel fire, burned 20 hours, steel and concrete construction. Didn't collapse. Twin Towers were 100% steel frame construction much stronger. Putting the block illustration more scientifically, if the 15 story section is falling at free fall speed, all of its gravitational potential energy is converted to kinetic energy (movement). It is not available to do the work of "crushing" the building below. It would have to slow down in order to do any other work, i.e., "crushing 80,000 tons of structural steel below, and that work quantity would have to be subtracted from momentum. In order for the full momentum of free fall to be achieved, the quantity subtracted would have to be zero. Clearly is does not take zero W, work, to crush 70,000 tons of steel. So, again, mass does not accelerate as it accumulates. It can only go much slower than free-fall acceleration as it meets resistance. This is in accordance with the irons laws of Newtonian physics. To illustrate what happens when a falling mass meets resistance, one only need think back to the old Prell Shampoo commercial of a pearl falling through shampoo. The pearl sinks slowly through the viscous medium, many times more viscous than air. Steel is thousands of times more resistant, even at high temperatures, yet we are to believe that a mass would have crushed it at the same speed it would fall through air. 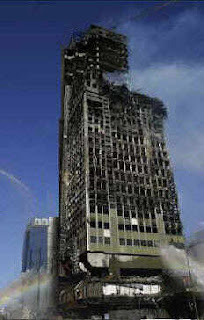 One self-described physicist maintains that the potential energy of the towers was sufficient to destroy the building. But potential energy is at equilibrium as a result of another force the writer entirely neglects: resistance. If resistance were not countering potential energy, all buildings should fall around our ears this moment. They do not fall around our ears because, unlike Jenga blocks or dominoes, resistance to fall is bolted and welded in throughout the building's structural members, including extensive cross-bracing and 3-inch thick steel gusset plates, placing the potential energy of the tower in static equilibrium. Jenga, dominoes, and playing card have zero resistance between their structural members, which is why they fall when a delicate equilibrium is even slightly upset. On 9/11, there was nothing to remove the resistance which kept the potential energy at equilibrium, that is, not transformed into kinetic energy. Cold fires, although they may have weakened some steel members, could not possibly melted them into a viscous medium through which a falling mass would closely approximate the rate of free fall through thin air. From every direction, including laterally in the event of 200mph hurricane winds, at maximum load, the Towers were designed to keep standing, and then some, as safety factors in high-rise construction are usually 5 - 6 times maximum load. The main backbone of the Towers consisted of 47 continuous five-foot-wide steel beams cross-braced extensively. A lateral hit by an airliner high up would demolish the plane, but barely dent the overall integrity of the frame. 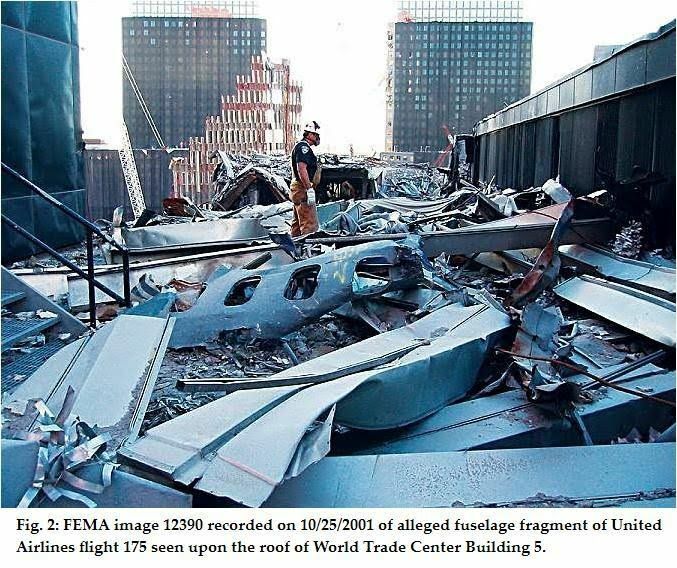 Plane remnants after crash into WTC. Wrap your mind around this law of physics, proven by Galileo, and you will see that the collapsing mass could not have gone faster as the mass got heavier. Therefore the official explanation for how the towers disappeared so quickly is false.